﻿ Who is Ken Meaux? A man with lots of depth, Ken is an artist, cartoonist, traiteur, ventriloquist, actor and incredibliy interesting Cajun from Kaplan (LA). You may remember him as a television personality on Fox 15 for over ten years. 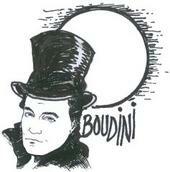 He was known as "the Great Boudini", a Cajun character introducing movies. A cartoonist for the world's only Cajun comic strip, Bec Doux et Ses Amis, his drawings captured the Cajun humor for which his fellow Cajun, Earl Comeaux, provided the French text. Ken is currently resurrected as an "in demand" magician and ventriloquist for various events around the state. He is involved in many interesting projects including "Le Petit Theatre du Paranormal", a theatrical production about a haunted cottage on Ron Gaspard's property, formally musician Bobby Charles'. This production is currently being filmed. His French word of the day entitled "Meaux du Jour" is in the editing phase for (AOC)Acadiana Open Channel in Lafayette. He currently resides in Vermilion Parish with his lovely wife, Stella. They have two wonderful children and three grandchildren. Ken is a full time professional Magician (entertainer) who includes Ventriloquism, Balloon Animals, Cartooning and Juggling in his act. He is unequaled in his ability to entertain and fascinate both children and adult audiences. As a professional ventriloquist, Ken had a television show on Fox 15 for ten years as "the Great Boudini". See video clips of his TV promotions - below.